The Nassau grouper is a medium to large fish, growing to over a meter in length and up to 55 pounds in weight. It has a thick body and large mouth, which it uses to “inhale” prey. Its color varies depending on an individual fish’s circumstances and environment. 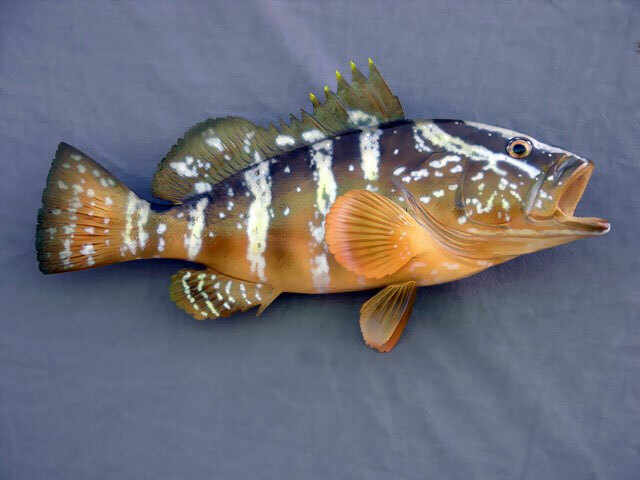 In shallow water (up to 60 feet), the grouper is a tawny color, but specimens living in deeper waters are pinkish or red, or sometimes orange-red in color. Superimposed on this base color are a number of lighter stripes, darker spots, bars, and patterns, including black spots below and behind the eye, and a forked stripe on the top of the head.